Cover cookie sheet with waxed paper. Hold each strawberry by stem and dip three-fourths of the way into yogurt, leaving top of strawberry and stem uncoated. Place on cookie sheet. Freeze 30 minutes to set first layer. Dip strawberries again in remaining yogurt for thicker coating. 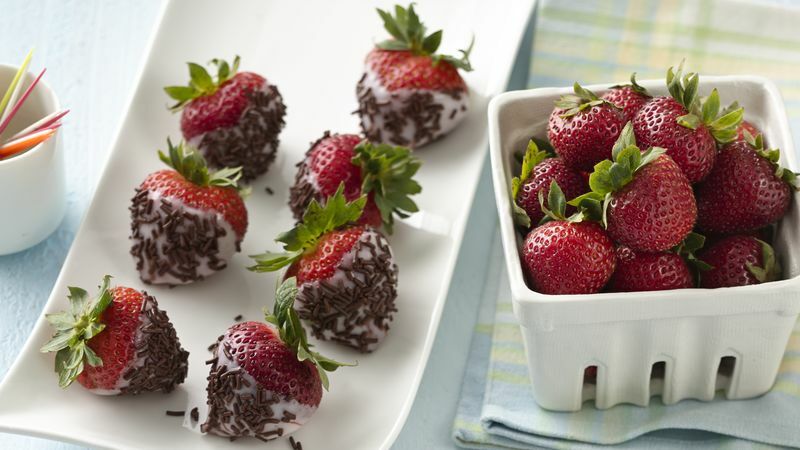 Sprinkle chocolate chips over yogurt-dipped strawberries, using small spoon. Refrigerate uncovered about 2 hours before serving. Store any remaining strawberries tightly covered in freezer, and serve within 1 week. Rinse strawberries with cool water just before you are ready to use them, and pat dry with paper towels. If you wash and then refrigerate the strawberries ahead of time, they will turn mushy. Double-dipping the strawberries is not necessary, but it will give you a nice thick coating of yogurt.